The overall public’s view of the health care law has continued to be negative since the initial October rollout (this month, 50% see it unfavorably and 34% favorably), but views have turned more negative among the key target group—those who are uninsured, according to a Kaiser Health Tracking poll conducted Jan. 14-21. 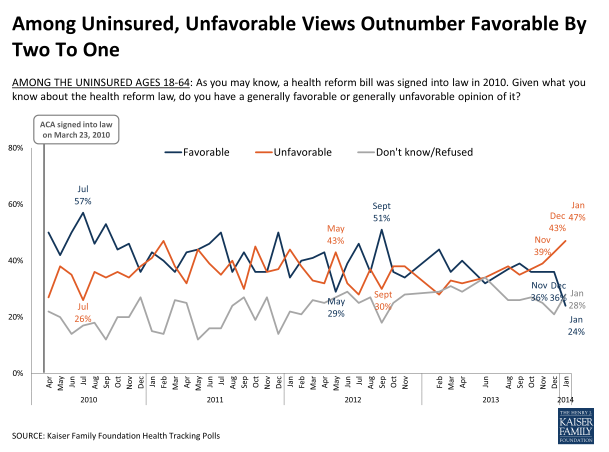 Among the uninsured, 47% express an unfavorable view of the law compared with 24% who regard it positively. That represents a negative shift since December when views were more divided, with 43% seeing the law unfavorably and 36% seeing it favorably. While many of the uninsured may have a negative view of the law, Kaiser also found that 73% of them see coverage as something they need and 50% say they plan to obtain it. Four-in-ten say they expect to remain uninsured, with most citing the cost of coverage plans as a reason. Among the uninsured who plan to get coverage, Kaiser found that many were unsure about where they’d get it. The poll showed 17% who either didn’t know yet or refused to answer, while smaller numbers say they’d turn to private insurers, the marketplace, an employer or Medicaid. A Gallup poll conducted Jan. 2-28 showed 53% of all uninsured Americans who say they plan to get coverage while 38% say they are more likely to go without coverage and pay the fine that the government would impose. Of those who did plan to get insurance, 56% say they would do so through a government health insurance exchange.